The Imaging and Medical beamline (IMBL) is a flagship beamline of the Australian Synchrotron built with considerable support from the NHMRC. 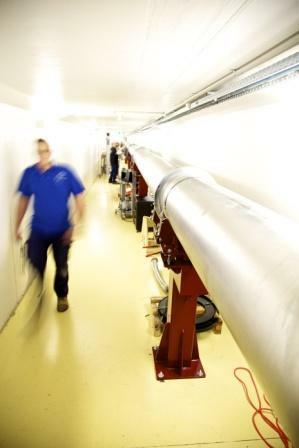 It is one of only a few of its type, and delivers the world’s widest synchrotron x-ray ‘beam’. The IMBL provides medical researchers with ‘x-ray vision’: dynamic 3D x-ray imaging at incredibly high resolution so as to reveal minute differences at the interface of air, tissues and bones: the starting point of many diseases. It can visualise blood vascularisation, air movement in the lung, and tissue and organ structure in far greater detail than that possible with MRI. The beamline provides an exciting discovery space for accelerated research into treating tumours, chronic lung disease, haemorrhage and inflammation of the brain, bone growth and replacement, and various heart-related conditions. A ground-breaking aspect of the IMBL, is the scientific team’s ongoing collaboration with a coalition of Australia’s leading medical researchers to develop future potential new radiotherapy methods, using the x-ray beam, that could destroy whole tumours with minimal disruption to the healthy tissue. While medical studies are the primary focus of the IMBL, in refining and validating its various techniques for use on biological tissues, there have been many fascinating opportunities to apply this exciting ‘x-ray vision’ to studies of industrial and other materials. These include mineral studies such as the structure of coal to inform improved coal-seam gas recovery and sequestration; food technology investigations that are looking at Australian wheat’s baking performance, and even archaeology studies – such as being able to see through bedrock to a dinosaur skeleton, to determine the molecular structure of their last meal between their teeth!